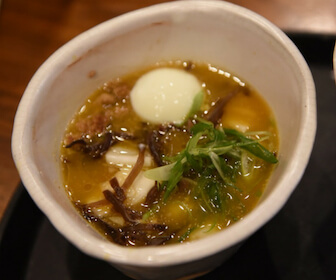 15-year-old chef Josh Reisner is now establishing his own style in the ramen world. While receiving professional training with ramen masters, this teen chef is also dedicated to creating personal recipes and applying new ideas. “I love what I’m doing – we show ourselves through our bowls (of ramen)!” Young chef’s eyes sparkled when he talked about his devotion to the ramen world. Josh Reisner, a rising culinary star from MasterChef Junior, spends his daytime at a school like other common 15-year-olds but dedicates the rest of the days to the kitchen thinking about how to make ramen that is unique and delicious. Growing up with his foodie parents in Forest Hills, Queens, Josh began his gourmet journey since a very young age. He took the first bite of solid food at only 4 months old – a piece of ikura (salmon roe) as his initial taste of Japanese flavors – and started dining at fine restaurants by the age of 3. This early exposure to culinary treats helped Josh to develop his palate. The talented chef could clearly distinguish the ingredients in a dish and remember almost every single food he has had. Josh is best known for his specialty and interest in ramen. But how come a native New Yorker finds a connection with such a typical Asian cuisine? When talking about his ramen passion, Josh recalled his first trip to Tokyo in 2013, where he tasted the authentic miso bowls. “I always loved ramen, but the trip was how I discovered ramen could be so rich,” he said. “It’s not just the noodle or the soup, each bowl had a different undertone and flavor.” This trip sparked his earnest curiosity of the food and made ramen his favorite cuisine ever since. This junior chef never restricts himself to the existing ramen types. He is full of innovative ideas and actively considering how to make ramen with new concepts and unique approaches. One of his primary desires is to incorporate seasonal greens into the bowl, which he calls it “farm to table.” This creative ramen maker always finds his joy shopping at local farmers markets to collect inspirations for his next cooking. What matters the most to him, he said, is to take one vegetable as its optimal time and put optimal care to it. In summer 2018, Josh created a bowl of “Garden” ramen with smoked garlic scape and thick chicken broth. And last fall, 2017, he designed a sesame Tan Tan ramen highlighting roasted pumpkins. Besides seasonal vegetables, he is also passionate about integrating western techniques and reusing left-overs. There are five basic elements in ramen: soup, tare (sauce), topping, noodle, and aroma oil. Most people forget the last part when cooking ramen at home, but adding it will totally enhance the entire bowl. If you are making your own soup, you can take the fat from the top and put it in a pan, add some garlic and onions, strain the oil, and put that on top of your ramen bowl. Shio (salt) is probably the simplest type of ramen, but it’s also the most difficult to succeed. Because it’s so light and simple, you need to work with fragile ingredients and carefully control every single variable. If you mess up one part, you will likely end up ruining the whole bowl. Shoyu (soy sauce) ramen, to the contrary, is easier to handle for beginners. Because soy sauce covers the major flavor, it won’t be as harmful if you mess one element. In short, when you wish to challenge and improve skills, make Shio; looking for an easy attempt, make Shoyu! Once you know the basics of how to make ramen, you can be creative and add your choice of ingredients. But before you mix everything, think about what ingredients go well together and how to make taste flow smoothly. The most important thing is to taste what you have, pay attention to small details – from the noodles to the tare, from the size of toppings to the time of boiling – and adjust to make sure every single element is in balance. It is another cooking tip, and it’s also Josh’s unwavering belief throughout his ramen journey. While he is vigorously establishing his personal style, he continued learning how to make ramen in the traditional way. 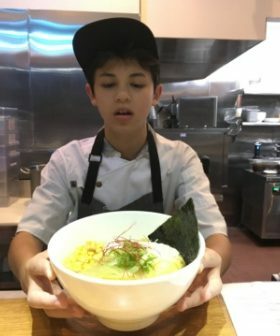 The teen chef expressed his sincere respect to the Japanese culture and his eagerness to understand the history behind ramen. He considers absorbing the standard ramen basics as the fundamental step of creating something new. “I need to know the boundaries before I can push further,” he noted. After realizing his early passion for ramen, Josh has apprenticed to the finest ramen masters in the city. His mentors and collaborators, to name a few, include Kenshiro Uki from Sun Noodle, Keizo Shimamoto from Ramen Shack, and Hideto Kawahara of Hide-Chan Ramen in Japan. In summer 2017, Josh also received systematic training at the Rajuku Ramen School in Sagamihara, Japan, for the authentic skills and recipes. Josh has practiced his creative ideas through various pop-ups, where he designed original menus and served his own style of ramens. 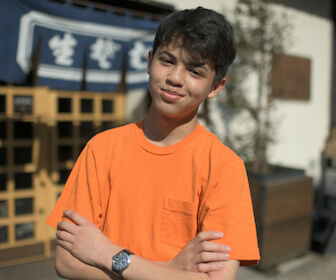 In the past few years, this teen chef has accumulated a rich experience of putting together craft ramens and dealing with real-time challenges. At his first pop-up booth, for example, Josh collaborated with two chefs in a 4-square-foot kitchen to cook two ramens and four sides for 80 people, for two rounds, with insufficient tableware and customers with food allergies! Josh described his first pop-up as a “crazy” experience, but the challenge never diminished his enthusiasm for hosting more. He enjoyed every unique collaboration and appreciated the growth each has brought to him. “Pop-ups are extremely important, and I will never stop doing it,” he assured. Josh will host another pop-up at Ramen Lab by Sun Noodle, in association with the upcoming Ramen Summit 2.0 at the AnimeNYC convention, where he will collaborate with two other ramen enthusiasts. With a confident smile, Josh revealed that he already had two of the three dishes in his mind. Josh Reisner is a professional chef based in New York. He is 15 years old but has been bustling about in the kitchen for two-thirds of his life! He started cooking since 5 and became a promising star in the culinary world at the age of 10 after he made it into the Finalist of FOX’s MasterChef Junior television show. Josh has a fervent enthusiasm for ramen. Since 2013, he has been staging (interning) at well-known ramen restaurants in the city, holding ramen demos at food festivals around the country, teaching ramen lessons in cooking camps, and hosting pop-ups with like-minded ramen devotees.